Perhaps one of the finest J80s in the country. 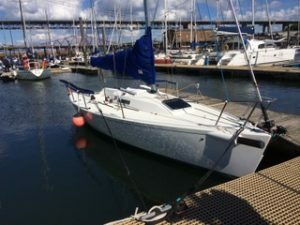 Launched 2011, very lightly used, surveyed last August with the surveyors comments – “It is obvious that the vessel has been lightly used and is in the surveyor’s opinion in excellent condition for her year”. (Survey available on request.) Since I purchased her last year I have improved her considerably adding new North sails main, number 3 and number 1 genoas (the number 3 has only been used five times), added a new Genoa track for the number 1 genoa, added tactic wind instruments, a mast mounted micro compass, new LED mast head lights and purchased a new lighter outboard motor (a 3.5 HP four stroke). A good spinnaker and older dacron sails are included. The boat is antifouled and ready to go. The boat is at Port Edgar and I will deliver locally. A four wheeled trailer, fully serviced in August 2016 is included. Excellent club racing record. Only being sold as I am changing to a much larger cruiser/racer.